Dillian Whyte has defended the credentials of his upcoming opponent Malcolm Tann, who “The Body Snatcher” will fight, in his US debut, on the big Terence Crawford-Julius Indongo card on August 19. Though Tann has had just two fights in the last nine years, one win and one loss, Whyte says his 6’6” foe will provide him with added experience as far as fighting big guys goes. Whyte, in speaking with Sky Sports, also made clear his intentions of keeping himself active from now on; with two more fights planned for after the Tann bout. “Be very careful of what you ask for Dill Pickles….for you just might get it,” Wilder wrote. After Whyte has dealt with Tann he wants to fight bigger names, two this year. 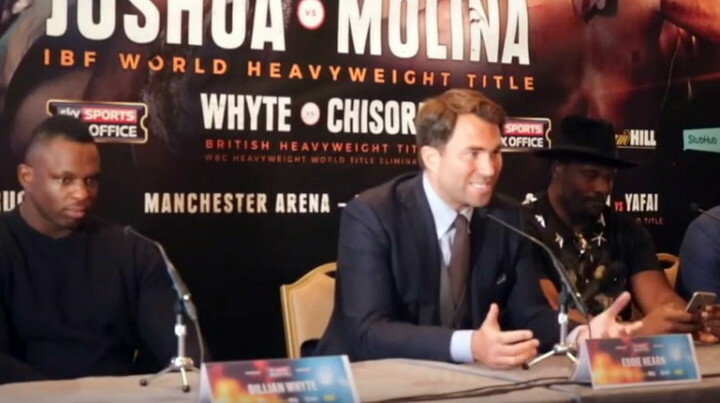 Whyte listed the fighters he has on his immediate radar: “There are guys like Manuel Charr, Dereck Chisora, Chazz Witherspoon, Jarrell Miller, Deontay Wilder, even Gerald Washington. Three of those name make for some good excitement when listed as possible dance partners for Whyte (I’ll let you decide which three!) but most of all, it’s good to see Whyte planning to fight often (last going to war in December, against Chisora). A good fighter and puncher, we could stand to see as much of Whyte as possible.